What do Bill Cosby, cult leader Charles Manson, and daredevil motorcyclist Evel Knievel all have in common? It sounds like the preamble to a particularly clever joke (or maybe just a particularly bad joke). The answer, however, is that they all recorded songs in a not-much-to-look-at, often-trashed studio called Sound City. Classic albums by artists such as Fleetwood Mac, Nirvana, Neil Young, Rage Against the Machine, Johnny Cash and many more were also recorded there (a complete list can be found on this Sound City website). Barry Manilow even found his way to Sound City for a 1982 album. In a recent documentary titled (what else?) “Sound City” by Nirvana/Foo Fighters’ Dave Grohl, we get to jump into the way-back machine and relive this unique story of technology and people combining to create an institution that’s on its way to attaining mythological status, especially now that it’s closed. Sound City was founded in 1969 by two aspiring music impresarios named Tom Skeeter and Joe Gottfried in a nondescript, low-rent area of warehouses in a neighborhood of Los Angeles called Van Nuys. Though its roster of clients through the years included millionaire musicians, looking at the street view in Google Maps even now, it’s still an area of blocky buildings, fences topped with barbed wire, plus lots and lots of pavement. Sound City was never known for its luxuriousness. It’s referred to as a dump numerous times in the movie by the interviewees. Yet, this “dump” had one of the best sounding rooms for recording drums in any studio the world over. You may think it would take a team of audio engineers and architects to design and create such a room. But, in fact, it was just by chance. Any renovations to Sound City over the decades always pointedly left the room untouched. Even the paint was the original, out of fear that the slightest change might alter the room’s acoustics. But, let’s get to that mixing board – the Neve 8028 mentioned above. This particular Neve console was built especially for Sound City by audio engineer and inventor Rupert Neve in 1973. Rupert Neve has been called the “father of the recording console” and his console mixing boards are largely responsible for how we hear recorded music today. The custom-built 8028 cost $75,000 at the time – twice as much as Sound City co-owner Tom Skeeter’s house, which he had recently purchased. He jokes in the film that luckily, his wife never knew how much the board cost. 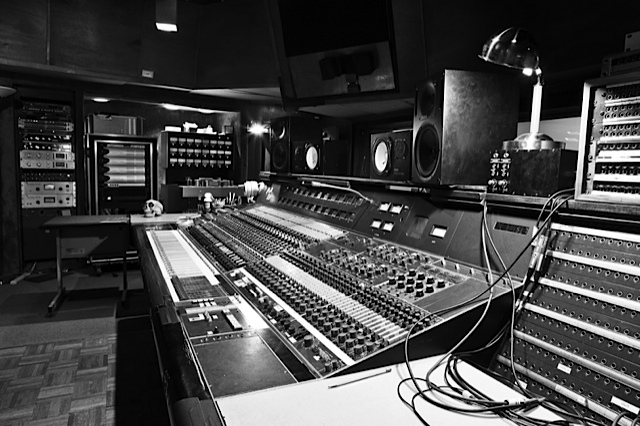 Stevie Nicks and Lindsey Buckingham, a virtually unknown folk rock duo in 1974, were the first artists recorded on this Neve as they tracked their debut album. During this time, while scouting Sound City as a possible place to record the next Fleetwood Mac album, Mick Fleetwood heard a playback of the Buckingham Nicks track “Frozen Love”. Fleetwood was so impressed by what he heard that Buckingham and Nicks were asked to join the band, resulting in the multi-platinum success story the band soon became. More important for Sound City, he was also impressed by the way the recording sounded. Fleetwood Mac recorded their next, self-titled album (featuring “Rhiannon”) there, setting the stage for a late 70’s studio client list that included Tom Petty, Foreigner, Cheap Trick, The Grateful Dead, and more. In the documentary Petty and other artists, such as Lindsey Buckingham and Reo Speedwagon’s Kevin Cronin, speak fondly of their experiences recording during this late 1970’s golden age of Sound City. The studio was doing well, but things were going to take an even bigger jump very soon. About this time, Sound City co-owner Gottfreid had begun dabbling in artist management. He hit pay dirt with a young actor/musician named Rick Springfield. Springfield’s song “Jessie’s Girl” was released in 1981 and was soon all over the airwaves and reached #1 on the Billboard chart. Much of this financial goldmine was fed into Sound City by Gottfried. Yet, by the end of the 80’s, despite the studio having become a favorite of hair metal bands, and stalwart clients like Petty and Pat Benatar still using the studio, Sound City was struggling. Salvation came in the form of a three piece grunge band – then a genre relatively unknown outside Seattle – named Nirvana. Geffen Records had recently signed the band and booked them time at Sound City with small expectations and more or less forgot about them while they recorded what would become the multi-platinum Nevermind. Nirvana drove all the way down from the Pacific Northwest to the studio and Grohl states in the film that when they arrived he was quite underwhelmed with the place. Nevertheless, Nevermind and its first single “Smells Like Teen Spirit” ushered in a revolution in rock music and Sound City experienced the same kind of revival they’d experienced 10 years earlier with Springfield. It couldn’t last forever, though, and the next threat came in the form of new technology which made home recording relatively cheap and easy. By the mid 90’s, software such as Pro Tools was quickly rendering the professional recording studio obsolete. At the very least, it was severely cutting into the their business. If the average musician could stay at home and do all his recording and sound manipulation on his own computer, what was the need to spend a small fortune and book studio time, a producer, engineers, etc.? Sound City hung on a little longer, mainly catering to bands that were well established and had ample money and to bands that wanted an analogue “old-school” sound. But by 2011 they weren’t profiting and were forced to close up shop, with Noah and The Whale’s appropriately-titled-under-the-circumstances “Last Night on Earth” the final album recorded there, according to the studio’s Internet discography. The Sound City documentary has a semi-happy ending. When the one-of-a-kind Neve 8028 board was being sold off, Dave Grohl purchased it and had it transported to his 606 studio in Northridge, CA. Grohl says that it took 4 months to properly dismantle and move the Neve and then it took a few hours for “a guy with a toothbrush to remove all the cocaine and fried chicken” from the innards before reassembly. Grohl, an easygoing, enthusiastic first time filmmaker, has a genuine affection for the studio and the music produced there and this comes across in the movie. He displays a reverence and respect for the history, the artists, and the technology involved. The famous mixing board probably couldn’t have found a better owner than Grohl. In his studio, it will continue to fulfill its function and not gather dust as a museum piece. In the movie’s last section, Grohl attempts to recreate some of the magic of Sound City’s past by collecting a diverse group of musicians, including members of his band The Foo Fighters, Paul McCartney, Stevie Nicks, ex-Nirvana bassist Krist Novoselic, and others. Footage of the recording for a cross-generational Sound City tribute album at his studio is a bit plodding at times, especially after viewing the well-paced studio story (but your mileage may vary). 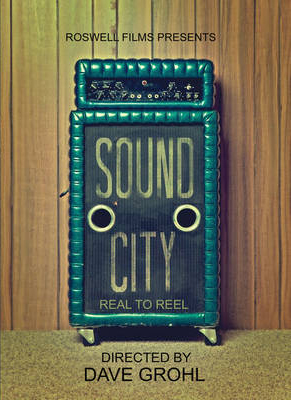 Regardless, the communal vibe that was so important to the behind-the-scenes story of Sound City is captured to a large extent by this Sound City Players collective, and the fact that they’re recording on the same equipment used in the studio, if not in the studio itself, brings a satisfying closure and the promise of continuity. 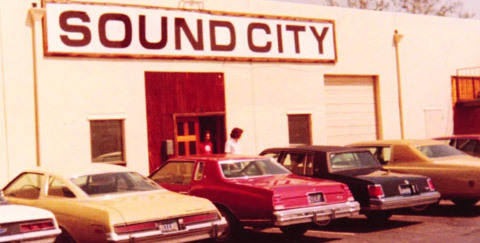 In a way, the story of Sound City comes full circle. Cool – let me know what you think when you see it! Rob: Thanks for this update. Sometimes it is amazing to learn about people who do great things, and all (sort of) behind the scenes. The upcoming Grohl film project (Sonic Highway) should be interesting.